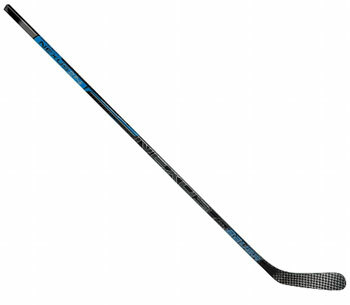 Bauer Nexus 2N Grip Stick 87 Flex 64"
2N is a step down from the 2N Pro. That said, it’s still built for the elite player who demands top-level performance from their stick. The 2N offers slightly rounded corners with slightly concave sidewalls for a great feel in the hands. The construction materials are upgraded from the N2900 with Bauer’s R3 resin system and 12K carbon fiber. The R3 offers a bit more efficient energy transfers for shots and a little more durability than the R2 system. And the 12K carbon is about 10 percent stronger than the 3K carbon fiber used in the N2900. The construction process has undergone a big upgrade this year. Unlike two-piece fused sticks, the sidewall thickness is significantly more consistent for a better balanced feel in the hands, and provides a more consistent puck-feel. The shaftwall consistency also provides a big increase in durability. Bauer’s Sweet Spot Technology in the kick point makes the 2N a versatile hockey stick. The Nexus line falls between the Vapor and Supreme lines in terms of playability, making it Bauer’s do-it-all stick that provides both a quick release but still plenty of power when necessary. The 2N blade features the R-Lite blade core. It’s the same core found in the 2N Pro and is Bauer’s most requested blade core at the professional level. Bauer essentially added a fiber-reinforced, rubberized dampening layer to the older 1X stick blade between the outer layer of 12K carbon and the core. The Nexus is perfect for those who prefer a softer feel. The lightweight core helps speed the shot release because the stick recoils a little faster. You also get a better balanced feel in the hands. The Max Balance Technology works extremely well with the blade features. The strategic fiber layering helps reinforce durability while removing weight from the stick. The blade’s 12K carbon fiber weave creates a nice feel for the puck and reduces weight, while adding durability and strength. The 2N senior stick is 64 inches long and weighs 447 grams. When cut to 60 inches, the weight is 425 grams, or 15 grams lighter than the previous generation’s stick. Be sure to note that Bauer flex-rates their sticks at 60 inches. Consequently, the 64-inch 2N has an 87 flex but will play with a little more whip than a typical 87 flex until the stick’s been cut down to 60 inches.